The first step to becoming a Lancer is to complete an online application form. CLICK HERE to apply online. Once you apply and create an account in the Admissions Portal, you will then be able to go back and check your application checklist as items are received. Please make sure that you make a note of your username and password to make future logins easier. 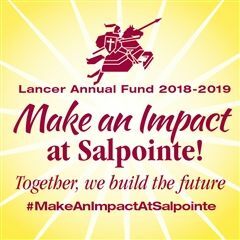 If you have a current student at Salpointe or are Alumni, please use the myPointe login information that you already have. It is not necessary to create a new account. Once you are logged in, complete all steps of the online application and click submit. There is a $60 non-refundable application fee that is paid online. Once the application has been completed and processed, you will need to complete all of the following checklist items. Details for all of the Checklist items can be found once you log into the myPointe site. This is the same login information you created for the application. Entrance Exam (HSPT) - The date for our next entrance exam will be emailed to families once their applications have been completed. The best preparation to be successful on the entrance exam is to work hard in middle school. Students should get a good night's sleep before the test and eat breakfast. Some students find it helpful to become familiar with the format of the exam. However, the daily academic activity in middle school is adequate preparation for the exam. If you do want more information on the HSPT, practice tests, learning modules and additional links to other information, please CLICK HERE. Student & Parent Interview - This will be scheduled once all of the above items have been completed. **Financial Aid - You won’t know if you qualify unless you apply. The application for financial aid is separate from the application for admission, although the two application cycles do overlap. Apply at www.fairapp.com and use school code 800 and school password ctso800. Our last financial aid application due date is April 20, 2019. Notification letters of acceptance, non-acceptance, or waiting list placement will be mailed and emailed on February 1, 2019.